Formal or casual, open plan or a dedicated space, there’s no other room in your home that brings people together like the dining area. At the Wooden Furniture Store you can find wooden dining room furniture that exactly matches your style, whether that’s one of our solid oak dining sets, or our ranges of warm and welcoming walnut or mahogany furniture, you’re bound to find the perfect something to make you, and your dining area, #HouseProud. Given the importance of the dining area in any home, the choice, material and style of furniture you choose is critical in creating that ideal family eating space. From a one bedroom apartment to a large family home, furniture is a key component to making your space perfect. 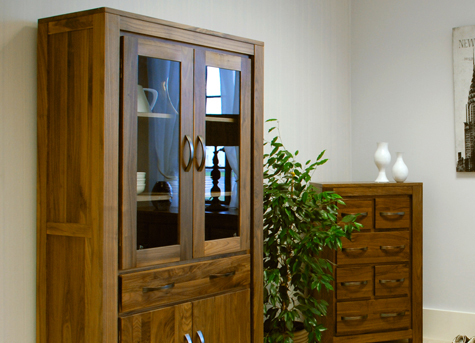 There are various options to consider when choosing high quality, solid wood dining room furniture. We always recommend that the first step is to decide on your preference of material, wood type and style that best matches the general aesthetic you are looking for. At the Wooden Furniture Store there’s a number of collections in several different styles, from the always popular and practical oak table and chair sets that would suit a large or growing family, to a rich, dark art-deco inspired walnut collection, all the way through to a more modern, industrial loft-style furniture – perfect for an apartment or flat. So it would appear a straightforward task to select the best wooden furniture – but actually it might not be as simple as it first appears. The dining area can be quite a challenging room to furnish given the need for it to be quite a flexible space; many homes cannot solely dedicate one entire room to just dining, and therefore it can end up playing a number of roles in the home. Just a quick search online will bring up any number of bloggers, interior design specialists and gurus offering their wisdom on how to create a stunning dining space. Of course this is great – assuming you have unlimited space and budget to do so, but here in the real world a more pragmatic and practical approach is needed. Whilst having some inspiration and advice is great, the dining room should be an individual space suited exactly to the needs of you and your family. So how do you choose the ideal dining furniture, given all the options available? We’ve put our thoughts down in this quick and simple guide to help you choose the dining room wooden furniture that will be ideal for you. 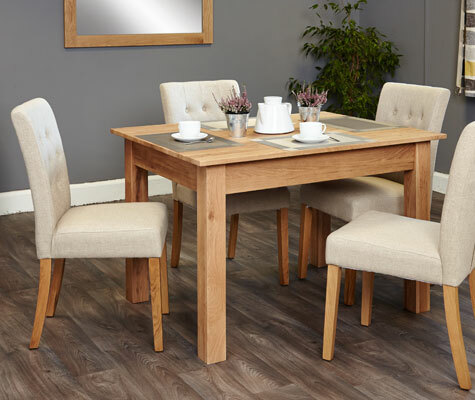 Always a favourite choice given its durability, solid feel and hardwearing surface, light oak and solid oak dining room furniture has plenty of advantages. Dining tables often put up with a fair amount of potential punishment and wear and tear, from hot plates and dishes marking or scratching the surface through to wine and other liquids staining and discolouring the beautiful oak surface. Therefore, it is important that any oak dining furniture is made from solid hardwood to last the test of time. Our most popular Mobel Oak dining range is an natural choice, made from solid hardwood oak to very high standards with lots of practical features. Strong and solidly built, it will last a lifetime. Who says dining always needs to be formal or traditional? 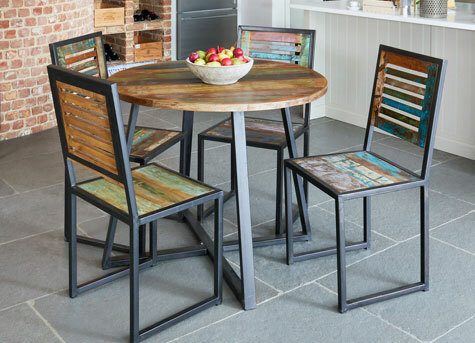 We think that one of the ways you can bring a touch of colour and vibrancy to your dining area is by using painted, recycled or reclaimed woods. A little more unpredictable and a lot more colourful than using more traditional materials, our Urban Chic reclaimed furniture range certainly creates an impact. 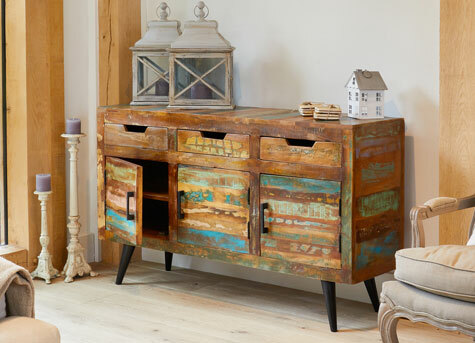 The metal box framework and rough reclaimed wood gives an urban, industrial feel and makes a real statement for those looking for a more striking and individual look. In recent years walnut has gained popularity as a material for contemporary dining furniture – not viewed as quite as traditional as mahogany but with much of the same attractive deep, rich and warm look, walnut is an ideal wood from which to craft dining tables, sideboards and other items. Very high quality, hardwearing and solidly constructed, we have two beautiful walnut ranges that look beautiful in any home. 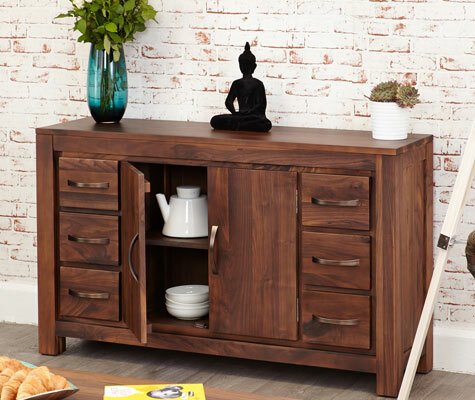 The dining room items from the Mayan range are attractive and stylish, crafted with sharp modern lines, and full of clever features, such as storage and space saving ideas. The slightly more designed art-deco inspired collection, the Shiro Walnut range has a more artistic feel, with rounded edges and plenty of interesting design features. 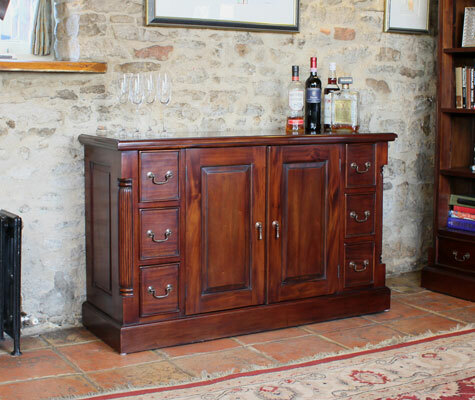 Often considered as a bit traditional or old-fashioned and mainly for stately homes or those with very traditional taste in home furnishings, mahogany is enjoying a bit of a renaissance in recent times. Our modern mahogany furniture blends the very best of the traditional with contemporary features and styling to bring this very high quality wood right up to date, suitable for any house or home. Nothing stuffy or dated about our mahogany dining ranges. The La Roque mahogany dining room range has a classic, high quality look packed with contemporary features specifically created to meet the needs of today’s modern dining – and does it in some considerable style. As many homes do not have the luxury of having either a dedicated space for dining or often much space at all, then the next step to creating the optimum dining environment is to consider how to make the most of the space you do have to work with. Ensuring that your space (which often may have to double as a second room of some description – maybe a home study or working area for example) is flexible and adaptable enough is key. If you need flexibility then an extending dining table is a great idea, offering extra seating for those special occasions when friends and family come calling. Alternatively, if space is a bit tighter then a four seat dining table would make the most of the space available and still seat a family of four comfortably. However if you are fortunate enough to have a little more space, then a good quality, solid six to eight seat table and matching dining chairs gives you all the room you need to lay on a fantastic spread to entertain the ones that you love. The ability to turn a messy and disordered room generated by a busy family into a calm oasis often relies on being able to add enough practical storage, usually in the form of display cabinets, sideboards and other storage units. To that point there’s often several basic items at the centre of every dining space– practical and stylish items that last year after year. These pieces obviously include a solid table and chair set but would be complemented by solid wooden sideboards, glazed display cabinets and bookcases for storing plates, placemats or other items. Having found exactly what you’re looking for, you’ll want to take receipt of your new furniture as soon as possible. There’s nothing much more frustrating than waiting too long for your new purchases to arrive, and that’s why at the Wooden Furniture Store we’ll have your new dining furniture to you within 10 workings days (as long as it’s in stock at the point of order). From the moment you order, our team will start planning your order. Our customer service and logistics team will plan the next available delivery slot to your area, and call or text with a suggested delivery date. Once that date is accepted, our skilled delivery teams will bring the new furniture into a ground floor room of your choice, delivering it with care and consideration so your new dining furniture starts life in your home in perfect condition. So why not order today and you’ll have your new oak dining room furniture in no time. Step Five: In need of some dining room ideas? If you are looking for a little bit of inspiration, a few ideas or perhaps some advice then there’s plenty of tips over on our blog to get you going. It’s full of useful articles, for example how to decorate your home for Easter entertaining and our guide to help you choose the perfect dining table – its full of ideas to help. 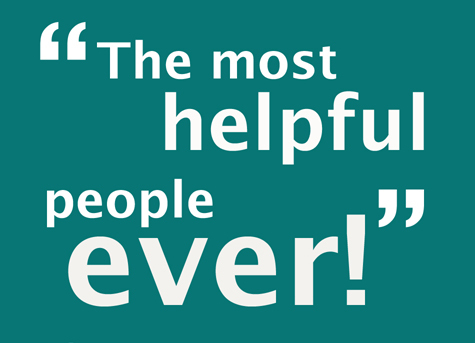 And if you are considering purchasing from us, here’s a real life story from a customer about our delivery services. We’re always on hand to help with our experts happy to discuss any aspect of selecting and buying wooden dining room furniture, just click the orange symbol at the bottom right corner of every page.